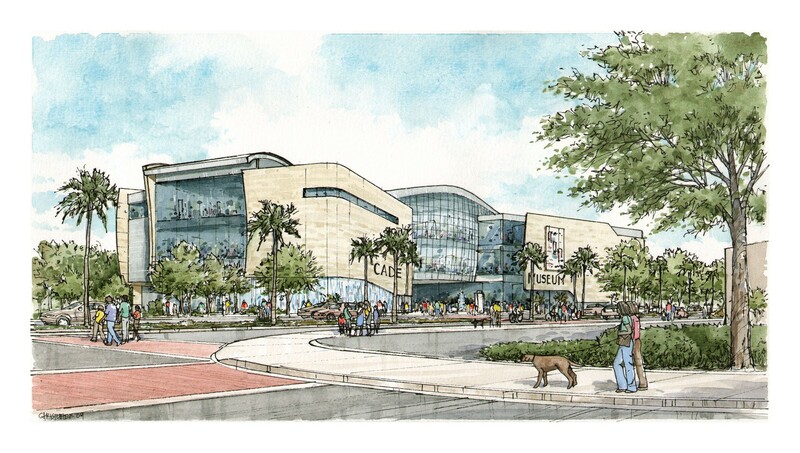 CRJA-IBI Group worked with a well known museum designer to develop site concepts for the proposed Cade Center Museum, designed to be a focal point within Depot Park in Gainesville, FL. The Museum is dedicated to inventions and in memory of Dr. Robert Cade, the inventor of Gatorade. The project followed up on CRJA-IBI Group’s contract with the City of Gainesville Community Redevelopment Agency to develop design standards for Depot Park. Using its recommendations for siting the Center’s footprint and its views into the Park, for circulation patterns in/out of the Center, and for the landscape directly surrounding the Center, CRJA-IBI Group developed conceptual design options to complement the Museum’s architectural design. The concepts explore design options for improvements to lighting, paving, planting and site furnishings. Paving patterns and internally illuminated vertical elements shown in the site concepts support the Cade Center’s mission of “innovation, inspiration, and invention,” with themes celebrating the generation of ideas. The site concepts include tie-in’s to Depot Park’s stormwater management mission, with a visible water quality enhancement system for the Cade Center’s roof run-off interpreted in the site, and permeable pavement systems featured in the parking lot.